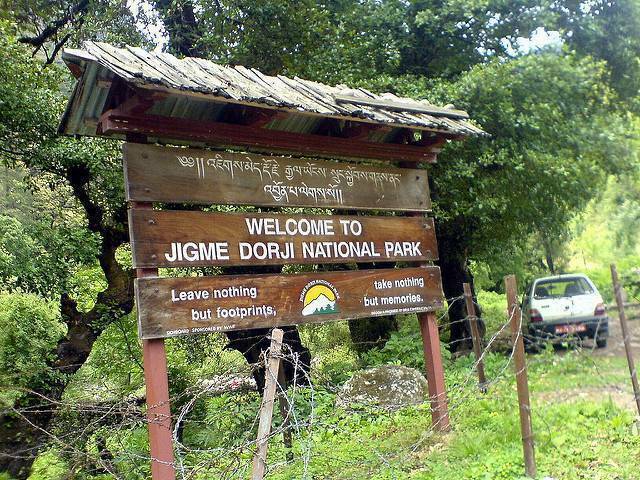 Named after the Father of Modern Bhutan, the Late King Jigme Dorji Wangchuk, the Jigme Dorji National Park is one of the largest and by far the oldest protected natural reserves in the country, located in the capital city of Thimphu. Stretching from Eastern Himalayas to the expansive glacial fields in the North Western region, the Park was established in 1974 and covers an area of more than four thousand kilometer square. It is extremely prosperous in bio diversity and houses a harmonious companionship of flora and fauna, including globally endangered animals like the Takin, Red Panda, Blue sheep, Snow Leopard and more than 300 species of birds. It also has a thriving number of meadows blooming with the likes of orchids, rhododendrons, edelweiss and many more. Interestingly, the wildlife sanctuary is also the only place to showcase all the national symbols of Bhutan, which are, the Takin (animal), Blue Poppy (flower), Raven (bird) and the Cypress (tree), together. Popularly also called the ‘Trekker’s Paradise,’ the Natural Reserve offers an enriching experience to trekkers from the rugged topography to the exotic scenery including a wildlife safari. It is truly a timeless experience to trek through the panoramic Himalayas and experience nature in its most unadulterated and idyllic form. The duration of treks can range from three days to a rigorous month long snowman trek. The Jhomolhari Trek is among the most preferred and popular with the tourists. Furthermore, the fortresses vernacularly called Dzongs, are sites of cultural and historical importance specifically the Lingshi Dzong and Gasa Dzong. It is also a watershed of four major rivers which have major dams built on them. The Park is a conservation jewel depicting an agreeable relationship between the denizens and the natural habitat. September is an ideal time to visit.